If you find your SMS inbox blighted by spam, and your phone is running Android, help is on the way – Google is rolling out a new spam protection tool inside its Messages app, according to users who've seen the update on their devices. First reported by Android Police, the change seems to happen server-side – which means you don't actually need to update your app to see it – but it doesn't appear to be live for everyone at the moment. The new feature is announced via an on-screen pop-up and can then be toggled on and off in the settings for the app. Based on a support page that has since been deleted, the feature does send some information back to Google (like the numbers behind incoming messages), but strips out data that could identify you personally, and the message content. In the absence of any official announcement from Google it's not completely clear exactly how the feature will work. Presumably Google's famous machine-learning algorithms will be deployed to identify messages that could be suspect. Google seems committed to focusing on the Messages app for Android and the web in the near future, and on the RCS messaging protocol that underpins in. 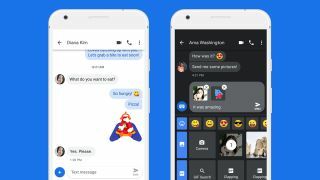 If this app is to be Google's latest iMessage challenger – following on from the likes of Hangouts and Allo – spam controls could be another feature to tempt users in. If an official introduction for the feature is forthcoming from Google, we'll update this article to include it. In the meantime, if you use Messages on Android, open up the app to see if the new spam controls have gone live for you yet.